SOMETIMES, IT’S THE LITTLE THINGS THAT HAVE THE BIGGEST EFFECTS. POWERDOWN EXPLAINS THAT WHEN IT COMES TO PROBLEMS WITH SUSPENSIONS, IT COULD HAVE ALL STARTED WITH AN INCORRECTLY ADJUSTED RIDE HEIGHT. Powerdown started out in 1983 by importing shock absorbers from the US and Europe, but it soon developed its own line of shock absorbers after deciding there were better ways to handle the unique aspects of the Australian outback. Today, Powerdown’s shock absorbers are found all over the globe, and the company backs up its products with a personalised customer support system. During its 30 years of assisting those in the commercial vehicle industry with their suspension issues, Powerdown has learnt that some of the problems can be easily avoided. Q: Powerdown has been offering support for all sorts of suspension related issues for over 30 years. What’s the most common problem you hear of? 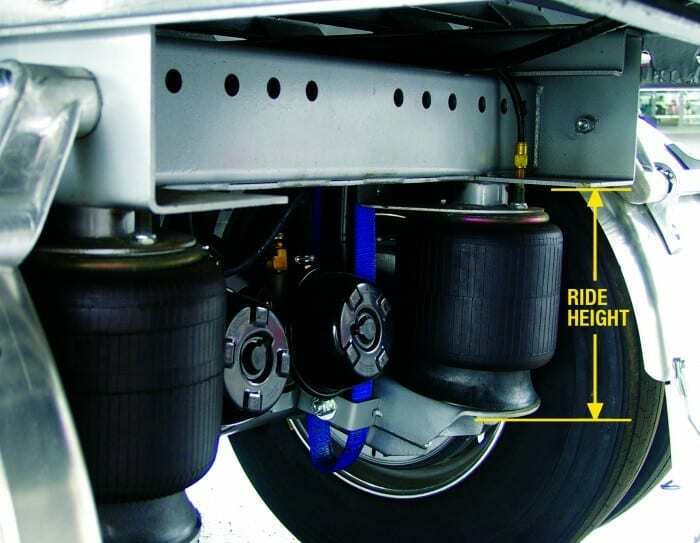 A: We frequently get calls about suspension-related issues that were caused by an incorrect ride height of the rear air suspension or trailer suspension. Problems occur when the ride height has been adjusted above the Original Equipment Manufacturers (OEM) recommendations, which alters the spacing between the axle and chassis rail. This may have been done as a ‘quick fix’ for a drive line angle issue, or to reach a certain kingpin height on a trailer, but unfortunately these changes will eventually lead to some expensive headaches in the future. Q: What parts can an adjusted ride height have an effect on? A: Changing the ride height above OEM recommendations has harmful effects on the shock absorbers, air bags and torque rods. Q. Can you explain the problems that occur with shock absorbers? 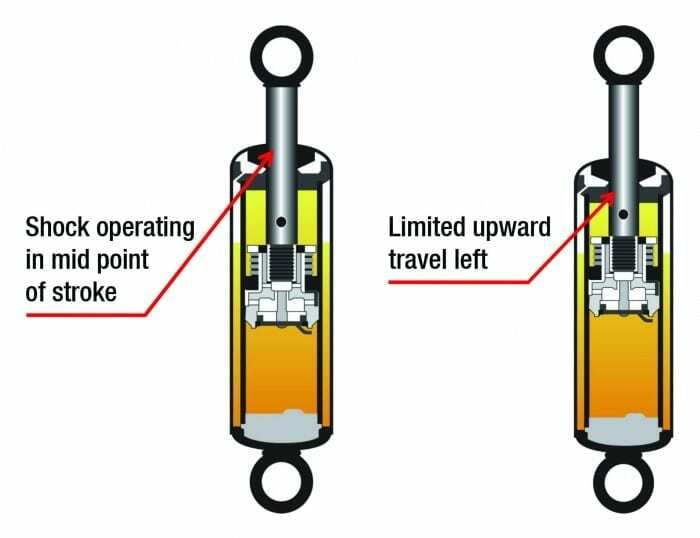 A: A shock absorber is primarily designed to operate in the midpoint of the extended and compressed length of the unit, so by increasing the ride height of the suspension, the upwards travel available in the shock absorber is dramatically reduced. This increases the likelihood of the damper topping out when the suspension articulates downwards. The piston will effectively hit the top guide of the shock absorber, causing fatigue issues in the design. A recoil cut off or rebound stop will limit some of the damage in the short term, but this feature is not designed for continual topping out of the unit. Q: What kind of long term problems can it cause? A: Over time the shock absorber will most likely leak oil due to internal seal damage from the constant impact, and in extreme cases the life of the shock absorber can be reduced by 80% of its normal service life. Q: How does an adjusted ride height cause problems in air bags? A: Similar to the shock absorbers, air bags are designed to operate within a set working height range. Changes in ride height above OEM setting will increase air pressure inside the bag, causing the suspension to ride above its normal ride height. Effectively this will reduce the available travel in the air bag when the suspension drops down a hole or gutter, potentially causing micro tears in the rubber. Q: What sort of long term issues have you encountered? A: Over time, the stresses in the rubber lead to air leaks and can potentially tear the rubber, which usually occurs when the rubber is vulcanised or sealed to the top or bottom plate of the air bag. The additional air pressure inside the bag also has a dramatic affect on ride quality. As the spring rate of the suspension is effectively increased it can lead to a harsh ride. 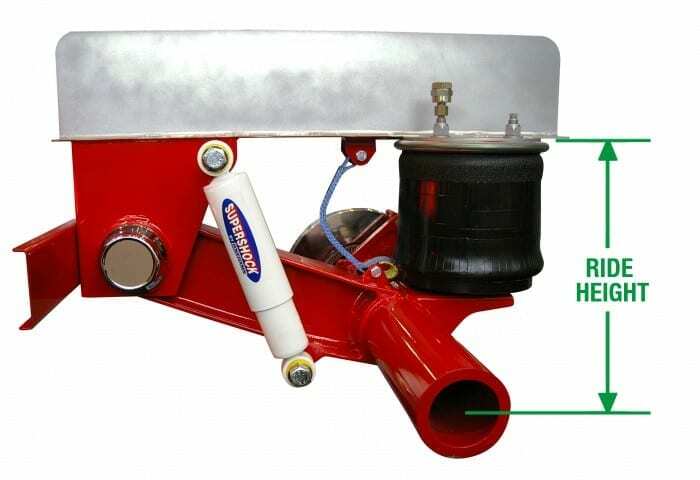 Further to this, the additional vibrations that are transferred into the body of the trailer from the increased spring rate can damage cargo inside the trailer. Q: What problems does it cause for torque rods? A: Torque rods are designed to operate on certain angles, ride height changes can lead to the bushes in the torque rods being placed under additional load, ultimately reducing their service life. If a vehicle shows any of the mentioned signs, we reccomend checking the ride height of the trailer’s air suspension against the manufacturer’s recommendations.